Crafty Tidbits: Grumpy Old Woman! 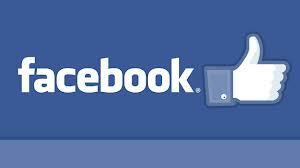 I've been fooling around with two "social media" sites, Pinterest and Facebook. For some reason, I just can't get my head around how they're working -- or NOT working, as the case may be. I've been scouring the Internet for guides on how to use them both and found several. They make it sound so easy, until I actually try to follow their instructions. As a former technical writer of computer manuals, I think I know my way around instructions pretty well. These, however, are either outdated (my screens don't look like the ones they show in the instructions) or are missing some vital steps. One of the cardinal rules of technical writers is to find someone with no previous experience with the program, then task them with working exactly to the instructions . . . no intuiting, no assumptions, just follow the black-and-white. That's the only way to know if you have left out anything. For example, if you (to simplify it) write how to change a tire(US)/tyre(UK), and say insert the jack handle, someone is bound to ask "What's a jack and where do I insert it?". So, first is Facebook. I've tried to "share" a photo or two. It appeared in my "Activity Log" but never on either my homepage or my timeline page. And why do we have TWO pages (the "newsfeed" when you click the word Facebook, and the "timeline" page when you click your name)? I probably was a member for a couple months before I even noticed I had a timeline page! Second is Pinterest. One one hand, I've become quite enchanted with this little gem, but on the other I'm ripping my hair out! Like the Facebook problem above, I wanted to share something and have it appear on my timeline page. No such luck.... One FB friend told me it appeared on her page. Fine, but it NEVER appeared on MINE, so how was I supposed to know???? I might have (but didn't) tried several times to share it, ending up with a half dozen of the same image on my friends' pages. . . and maybe they'd be so fed up they'd de-friend me! And while we're at it, how about Instagram. Same thing... wanted to share it on Facebook. I took a photo and Instagram said it had done it, but I can find no evidence except that, according to the Instagram app, another friend "liked" it. That would imply that it did go to friends, then, right? And just to add to my misery, this new blogger editor won't let me resize photos without choosing the size in a list. I want to size it myself (i.e. smaller than small, or perhaps in between two listed sizes). The stamped sentiment is not crooked on the card, it's just a wonky photo, honest! It's a "just because" card for a friend who's been a bit down lately. I based it on a beautiful card I saw on the Internet (Pinterest, in fact). 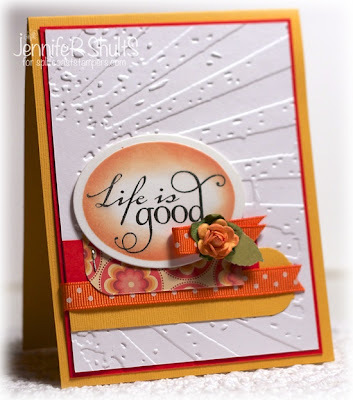 I wasn't sure who the original cardmaker was until I noticed the watermarked copyright: Jennifer Shults. I think hers is much prettier than mine, but I didn't have the same sentiment stamp and embellishments, but wanted to make mine just a little different anyway. I know imitation is a form of flattery but felt I shouldn't replicate it exactly, even if I would have been able to. Her card (above) is just gorgeous and I love the simplicity and "cleanness" of it. Ooh I have that embossing foleder - I must look it out. Your cards are fab.